At Cooking Up Ideas in Ashford this week we have made some fun emoji cupcakes! 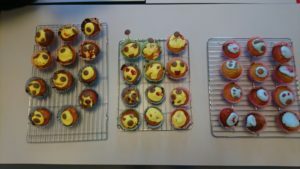 Using different coloured cake batter, icing and sprinkles the children managed to make delicious cupcakes which have faces on – the smiley face was obviously very popular as they were excited about eating! They created layers and layers of multi-coloured cake which when baked, looked and tasted amazing. The children enjoyed eating the cupcakes and learnt some skills in baking that hopefully they can use at home and in their future. 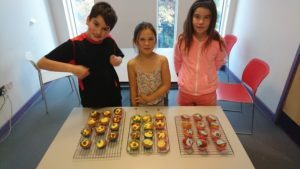 This was so successful that we have decided to run it again so others can get involved in making their own and learn the skill of baking in a fun way. Be sure to look out for when we run it next and get involved at Cooking Up Ideas Ashford!